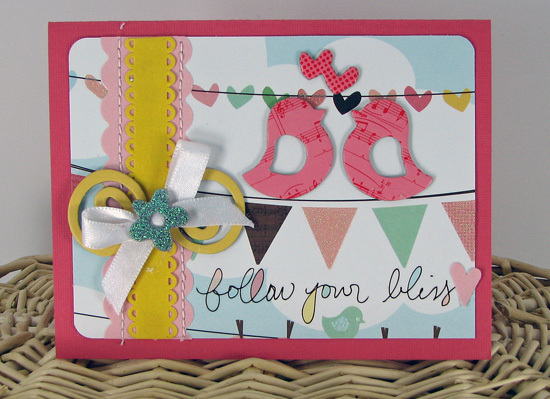 If you would like to play along check out the Bo Bunny blog and share your card with us! It's Tuesday and the weather outside is beautiful! I am lucky enough to spend the day with my two favorite girls and we are having so much fun! I hope everyone is having a great day too. Thanks so much for coming by today! I hope your day is great! Hi there! I am back from CHA, well it was in my hometown so I really didn't have to go far :), and ready to scrap! After looking at all the projects and new product from the show I am inspired to scrap, scrap, scrap. 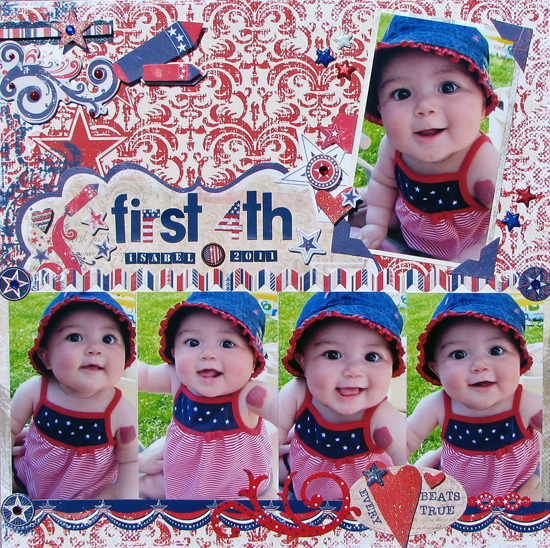 One of my favorite new lines that is a MUST HAVE for me is the American Crafts Amy Tangerine line. Swoon! When I saw it on their blog I was like it's OK...... 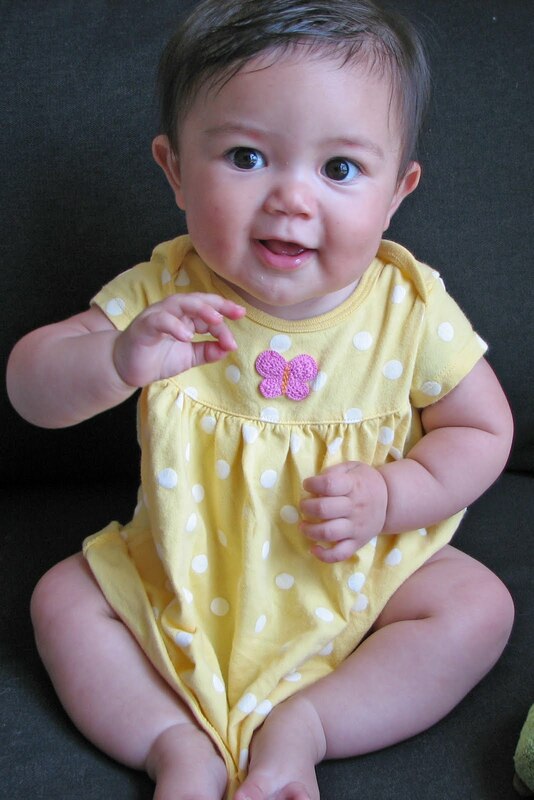 But in real life, oh my, it is cute! I even got to meet the super cute Amy Tan herself. Here is a pic of (from left to right) Amy Tan, Katrina Hunt, and myself at the American Crafts booth. 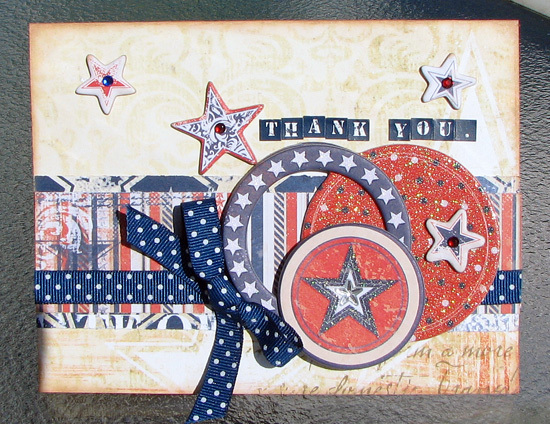 This weekend I just had to break out my American Crafts stuff and create a few cards. I think I have used up just about every inch of this paper line now! Who says scraps can't make cute stuff? I made these two cards from my scraps. Thanks for coming by today and letting me share! Have a fun Monday! Hello from CHA and a BIG giveaway! Hi y'all! I spent the whole day at CHA summer today and saw lots and lots of amazing products! When I came home my children had left destruction in every room of the house, but it was well worth it! The most common question I was asked by people- "How do you have time to scrapbook with a 8 month old and 2 1/2 year old?" Hmmm good question everyone. The answer is naps. I have been blessed with two little girls who love their naps. So it's been very easy to get them on the same schedule. I was able to take a few pictures of the Nikki Sivils Booth where I was working the make n' take table today. Like what you see? Well you can win all five of her new collections. Just hop on over to the Nikki Sivils Blog and leave a comment. Good Luck! 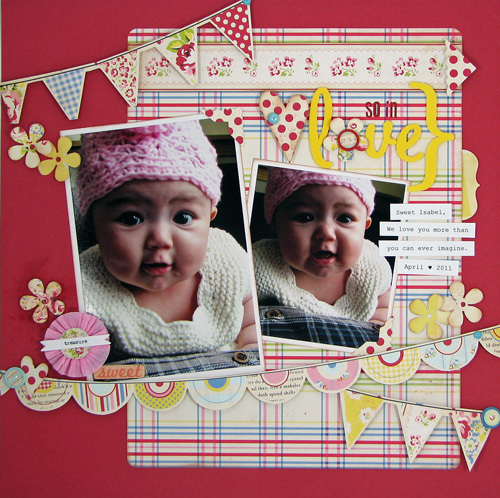 And here is one of my new favorite layouts that was up in Nikki's booth. Can you see it above? Yes, it's up there hehe! I used Nikki's new "School is Cool" line. I just want to point out that the journaling says my 2 1/2 year old wants to be a Scarlet Macaw rescuer when she grows up. Yes she actually said that. The girl is watching a little too much "Go Diego Go"! Thanks for coming by today! It makes my day to have some visitors! See you soon! Happy Friday! I hope everyone is keeping cool. It is a HOT one here! 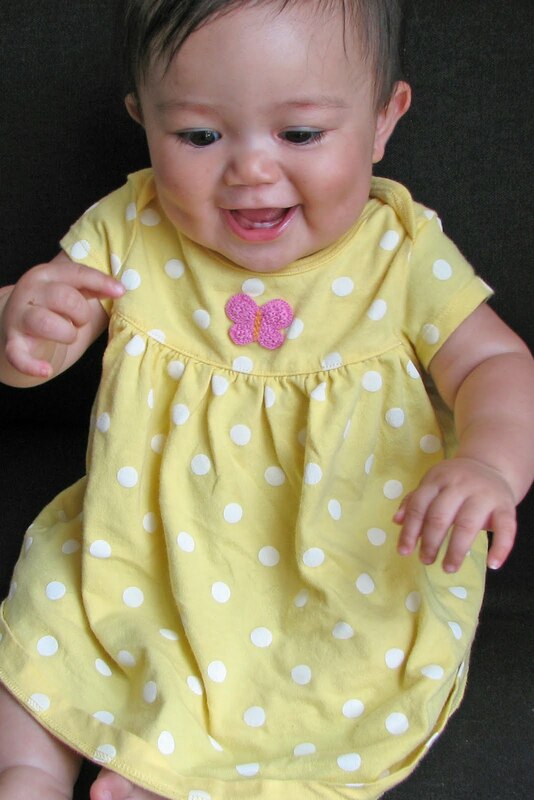 Speaking of hot weather, I dressed my little Isabel up in her yellow summer dress and took her 8 month pictures yesterday. 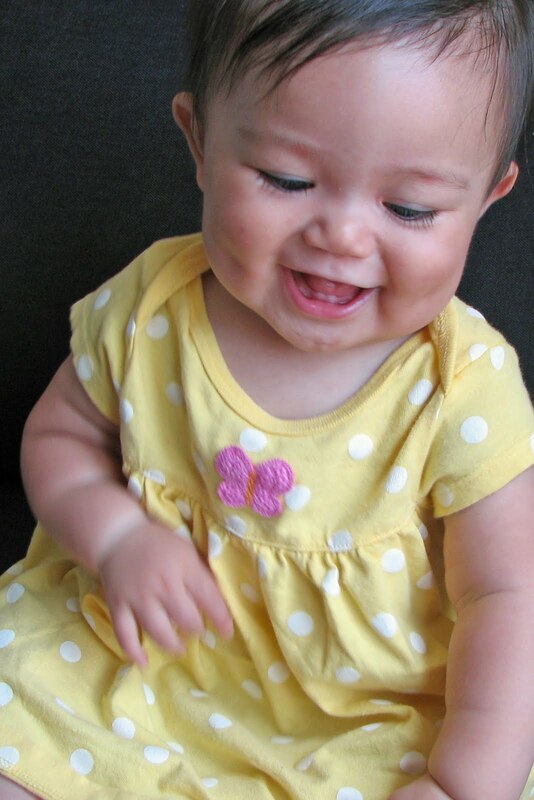 Isn't she just a little ray of sunshine? 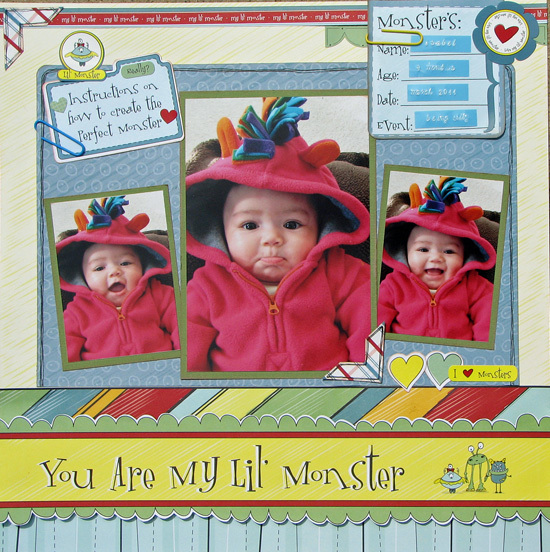 The complete My Lil' Monster line is up on Nikki's Blog. 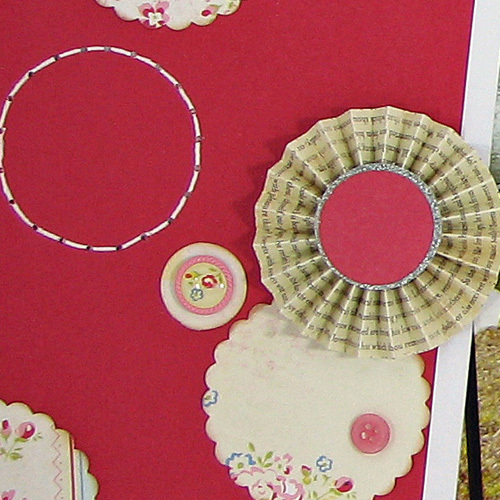 You can see all the super cute paper and embellishments from this line there. I will be at CHA next week working at Nikki's Make N' Take table. If you are at the show stop by and say hi! Do you have lots and lots and lots of photos to scrap? If you do then the post on the Bo Bunny blog today is for you. 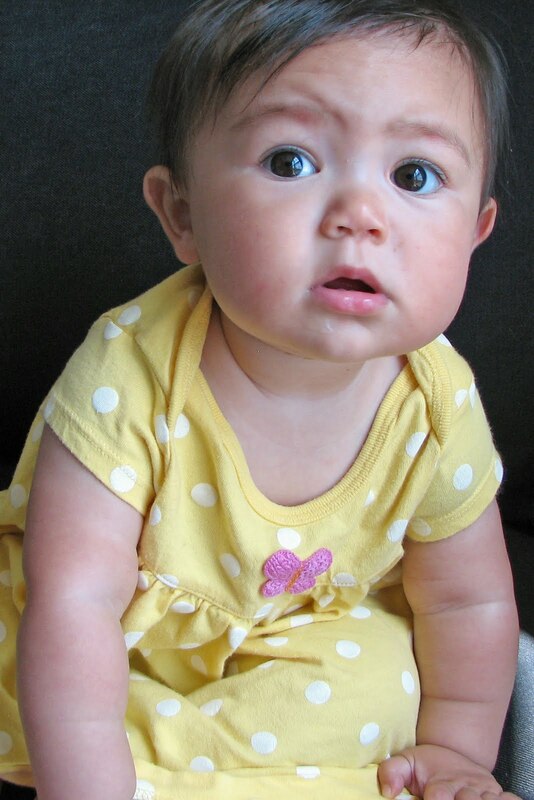 There is a new regular feature debuting on the blog today titled "More than 4". 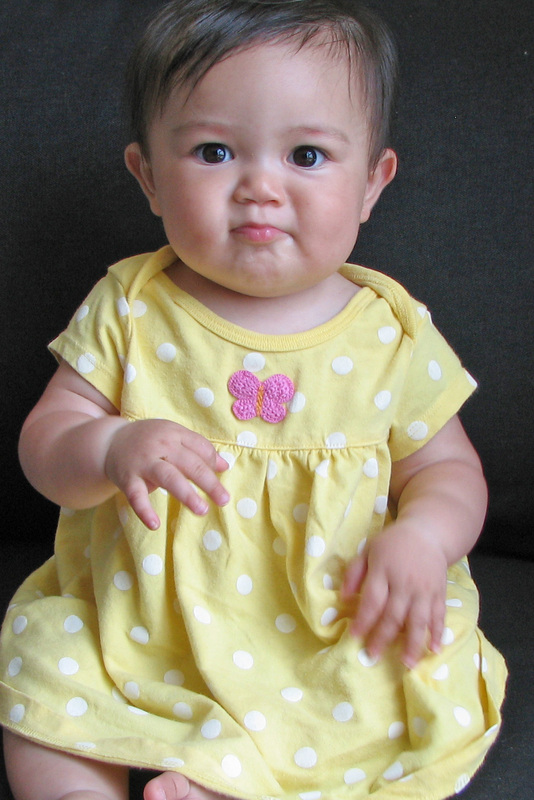 Now I love to scrap lots of photos, but unfortunately my little girlies are not always the most cooperative bunch. So I am lucky if I have one good photo from an outing much less more than four. But when I was given this assignment I knew exactly which photos I would choose to work with. I just couldn't decide which of these sweet photos to scrap so I choose them all! I know, I know they all look pretty similar, but mom's notice all the little subtleties and I can tell you each of these expressions is very different. So you can use my layout design to scrap 5 pretty similar photos or 5 very different photos. That is up to you! For my layout I cropped all my photos to 3"x4.5" so they fit better on the layout. Thanks for visiting me today! I hope to see you soon! 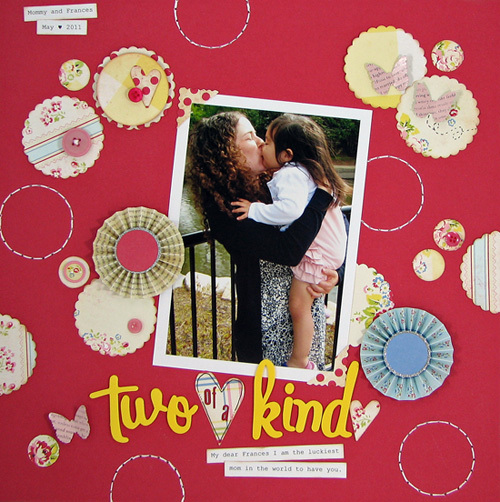 Some brand new not even in stores yet Nikki Sivils Scrapbooker! I created this using Nikki's new line "Gingerbread Land". How about a sketch today? Every month there is a sketch challenge over on the ScrapRoom's blog. This month's sketch is from the every so talented Jenny Moore. Don't you just love it? 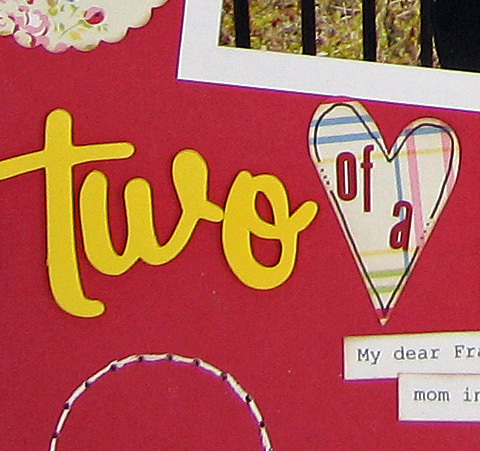 Everything was from the Double Shot kit and embellishment kit except the yellow letters. I also used some of my new dies that the kind folks at spellbinders sent out to me. Thank you Spellbinders for being so generous! If you want play along please visit The ScrapRoom blog for details! How about a card today? 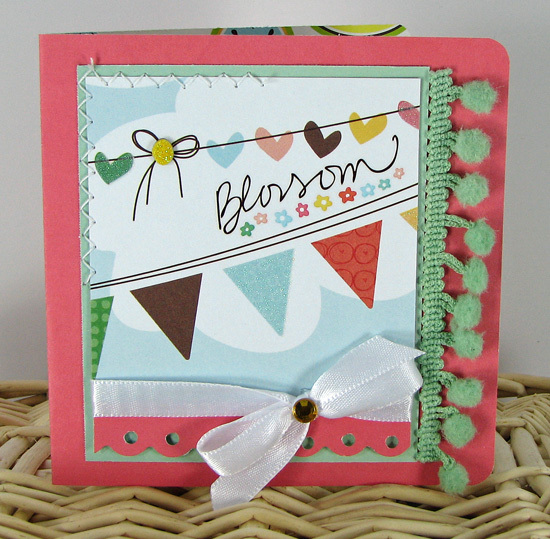 I have another card to share today from the July ScrapRoom kit! This paper is so fun and sunny it makes me happy just looking at it! Supplies from the July Double Shot kit except sentiment sticker (June Double Shot kit), twine, jewels and button. Thanks for looking! I have one more project to share tomorrow. Hope to see you then! Happy Friday! I am back with another project from The ScrapRoom's July Kit. First I trimmed my cardstock to make my card base then scored and folded it into a card. 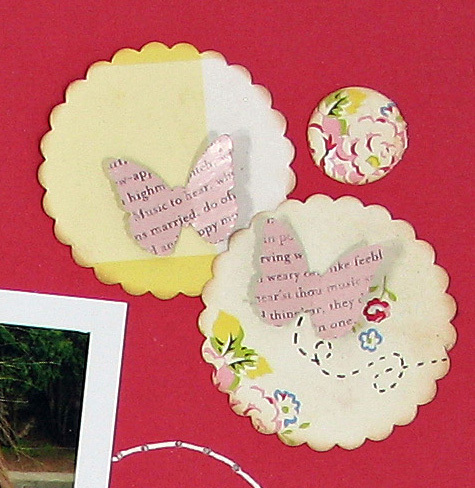 I then used a small circle punch (1 inch) to punch half a circle through both sheets of cardstock at the same time in the middle of the card on all four sides. Next I punched holes next to the middle ones. I think I may have added one too many holes on each side because it looks a little cramped, but overall it turned out great and was very easy to do! 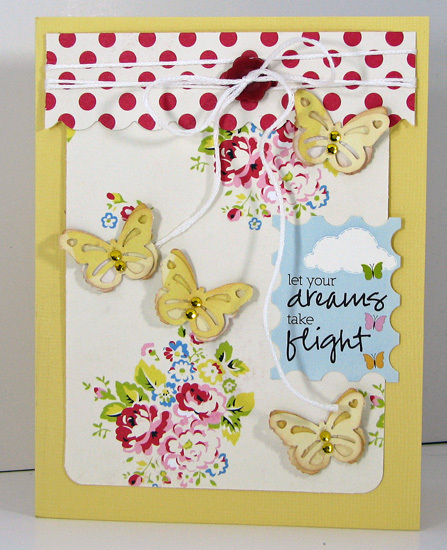 Everything on the card is from the ScrapRoom July kit except the sentiment, button and twine. But..... I did come back to lots of scrappy supplies that will be debuting at CHA this summer! 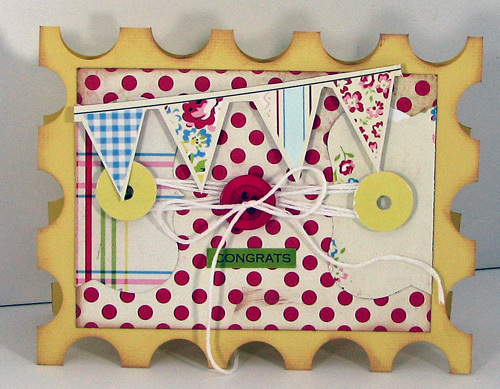 I also had an email in my inbox that a card I submitted to CARDS magazine was accepted for publication! Yay!! I have been sending stuff to magazines for over two years now and nothing. The only thing that was published in print was the layout in the Big Book of Scrapbook Layouts. So to say I have been discouraged is an understatement. Everyone said don't give up so I didn't and yay! My first put with CARDS magazine! While I was gone the July kit from The ScrapRoom was revealed as well. 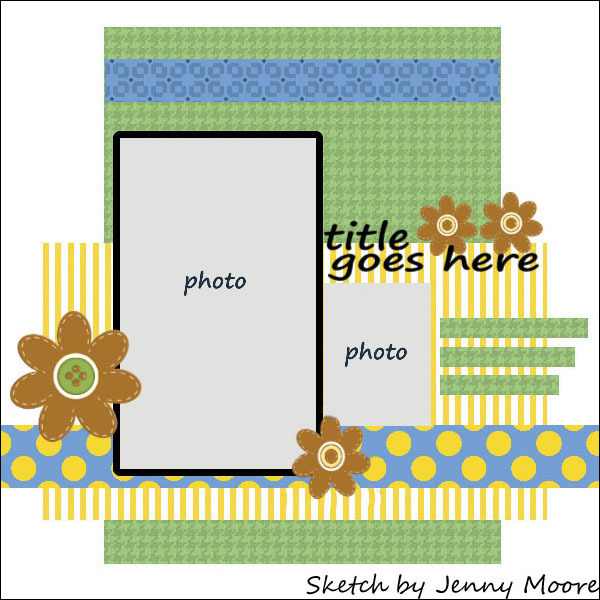 Today I will show you one of my new fave layouts. 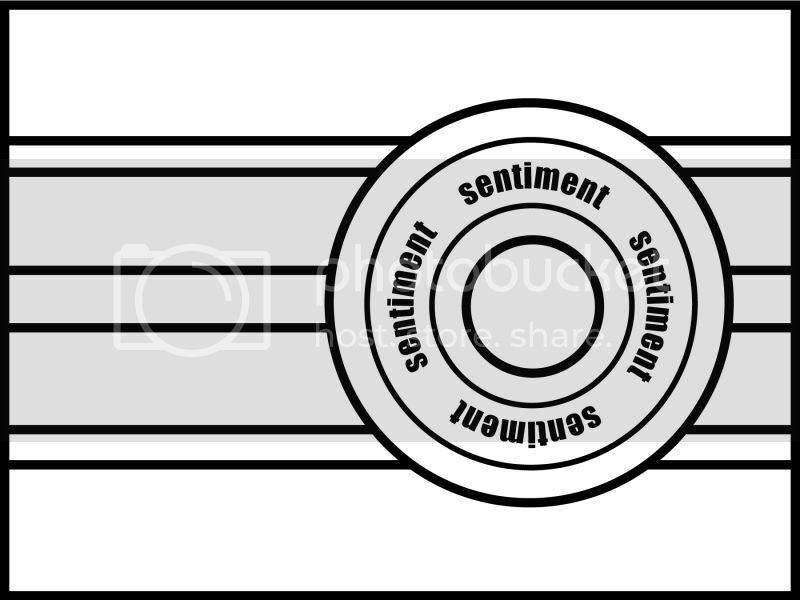 It is totally not my style at all, but I like to try new things every once in a while ;) If you know my work then you know I am all about straight lines and lining everything up just so. I love the grid! Circles are so not my friend and they never look right when I try to use them. So... I decided to jump right in and create a layout that is all circles. If you are going to do it then go all the way right? Everything is from the kit and embellishment kit except the yellow letters. The photo is of my sweet Frances and I on Mother's Day. Isn't she the sweetest? 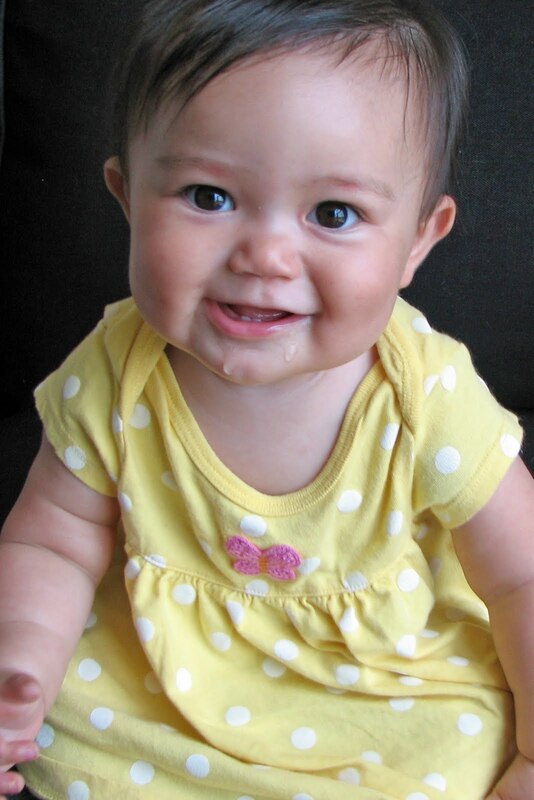 I chose the title "Two of a Kind" because although she doesn't look like me, we are exactly alike in personality. Thanks for coming by and I will have more ScrapRoom projects to show in the next few days! Plus next week I show what I have been working on for Nikki Sivils' booth at CHA!! I can't wait! Two great companies have teamed up to bring you some great projects- Nikki Sivils and Helmar! Helmar was nice enough to send me a bunch of their supplies to use with my Nikki Sivils paper and embellishments. And nothing goes better with Nikki's products than Helmar of course! I have been creating all my projects with my Helmar adhesives, but I saved one to share with you today! I thought Nikki's "It's Raining, It's Pouring" collection was perfect for these photos of Isabel all wrapped up in her towel after her bath. 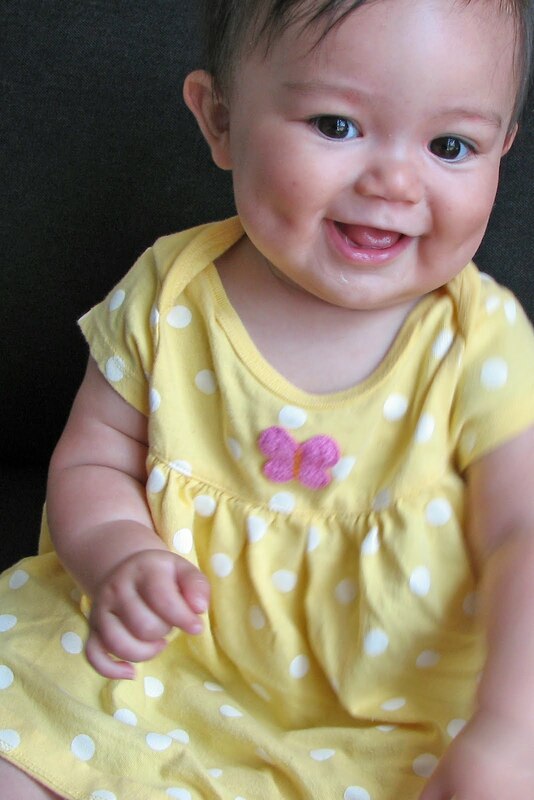 Taking a bath is one of her favorite activites so it wasn't hard to get some smiles from her! I added the little ducky to go with the squeaky clean title. I cut him from my Cricut Expression using the Wild Card cartridge (It is actually a chain of ducks, but I cut one out). Then I punched a bunch of circles for my bubbles. To finish it off I added some glossy accents to look like water splashes. 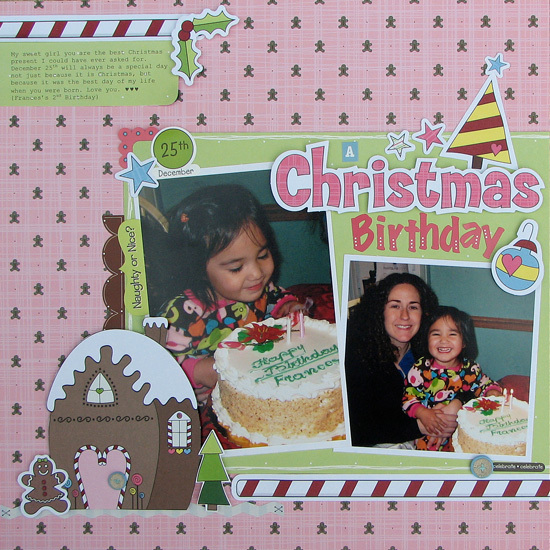 The Helmar products I used on this layout are: tape runner, liquid scrap dots, zap dots and quick dry 450. You can see some more Helmar and Nikki Sivils creations on Nikki's Blog.